Tobey Eugenio, Nature Explore Independent Consultant, for her inspiration, imagination, collaboration, support and faith. Grandparents, parents, aunts, uncles and many friends who donated to make the space possible. Distinctive Property Services for all they do for the school-the school would not be what it is without you. Nature Explore and Arbor Day Foundation for their research and commitment to keeping children and families connected to nature. 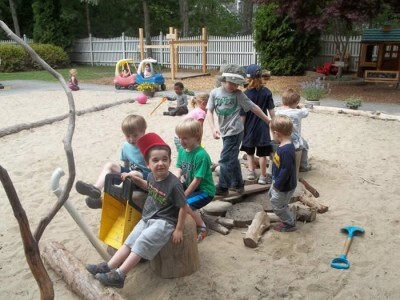 The outdoor space at Montessori Beginnings School has been transformed. Oak and evergreen trees grow throughout the space providing year round color. Azaleas and various low growing evergreens help delineate the areas while fragrant, colorful lilies help to carve out a special place for the Zen/Meditate Area. Large logs surround and contain the Messy Material and Dirt Digging Areas while vertical tree cookies, donated by a parent, were used around the Dream Area. Potted perennials are brought in at the end of the season to “weather” the winter inside. Many natural, cool tones were used throughout the space to give it visual interest and the use of many different types of natural materials helps keep maintenance down. Granite blocks, scrap wood roadways, wood stumps and planks provide ample opportunity for play while needing little upkeep. Meetings with the children and families were conducted to gather ideas and feedback for design and implementation. One main goal was to be able to enjoy the space all year long. It was decided that high priority items to include were: a giant log, swing set, playhouse, wood working area, storage where children can get their own items such as hula hoops,brooms, blocks, trucks and a Dirt Digging Area. The Dirt Digging Area is now one of the favorite areas. A quiet Zen garden was also included in a spot that was a bit of an eyesore before. Using a beautiful piece of gnarled wood from Heritage Gardens in Sandwich, and adding dark mulch and stepping stones made the children; the area was transformed. The children love to watch the birds from the classroom windows so a natural progression was to include bird and suet feeders that the they can help fill. A water feature was also added this summer and the children love it. They fill watering cans and douse the plants and flowers throughout the play space. 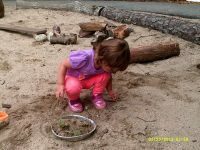 Children can also incorporate water into the Sand/Messy Materials Areas by bringing a hose into the space. 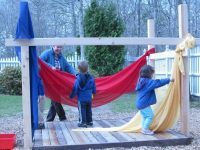 Dismiss from the outdoor classroom so parents can see the space in action and ask questions. Potential new family tours-an opportunity to show off this amazing space and emphasize the importance of nature and children’s connection to it.